Teachers staging walkouts around the country are asking for salary increases, but they’re also after something bigger: more funding for education, including replacements for old textbooks. In Oklahoma, teachers want raises for support staff in addition to $200 million more for their schools over the next three years. Kentucky educators want to make sure the state budget passes with no cuts to education. And in Arizona, where the threat of a strike is looming, teachers want to see education spending restored to 2008 levels, which is about $1,000 more per student than current levels, as well as a 20 percent pay increase. While a 5 percent raise was enough for educators in West Virginia to go back to work, teachers in Oklahoma said a 15 percent raise was not sufficient at a time when their schools need more funding across the board and the proposed raise would not make up for years of stagnant wages. Teachers there have spoken out online and in the news about shabby, outdated textbooks amid nearly a decade of declining school spending, caused partly by state tax cuts. Average teacher pay in Oklahoma is $45,276, which ranked 49th of all the states and D.C. in a 2016 analysis by the National Education Association. Kentucky ranked 26th and Arizona 43rd. That said, Oklahoma has the 3rd lowest cost of living in the U.S. — Kentucky is 16th and Arizona 20th — according to data from the Missouri Economic Research and Information Center. Although teacher pay seems roughly aligned to cost of living in these states, it pales in comparison to salaries of similarly educated professionals across the U.S., according to Organisation for Economic Co-operation and Development data. Teachers usually make about 55-60 percent of their similarly educated counterparts in other fields. In addition to low salaries prompting some teachers to work multiple jobs just to stay afloat, many educators are dealing with tight budgets at work. When adjusted for inflation, education spending in 29 states (including Oklahoma, Kentucky, and Arizona) was less in 2015 than it was in 2008, before the recession hit, according to an analysis by the left-leaning Center on Budget and Policy Priorities released last year. Wednesday marked the third day of walkouts in Oklahoma, with teachers continuing to press lawmakers to funnel more money into schools. Teachers said they felt Republicans, who control both chambers of the statehouse, were trying to wait them out. In Tulsa, a group of educators started a 110 mile march to the state capitol, Oklahoma City, which they expect to take seven days, according to NewsOK. The state’s largest school districts, Oklahoma City and Tulsa, announced schools will be closed again Thursday in anticipation of more demonstrations. A number of other districts have also cancelled class, some through Friday, because of the strikes. 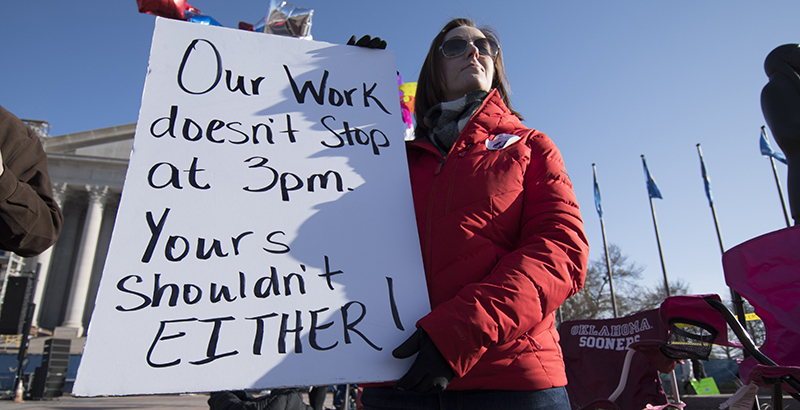 In Kentucky, many districts were already closed for spring break this week, but some slated to be in session canceled class Monday while teachers from across the state rallied at the capitol. There, teacher pay — and cost of living — are higher, but educators are protesting a change to their pensions that would make them more like the 401(k)s used in the private sector. Lawmakers have passed a bill that includes the pension change, which the governor supports but has not yet signed. Additionally, the legislature has passed a spending bill that increases per-student funding in public schools and includes other measures teachers support, the Louisville Courier Journal reported. Kentucky teachers are expected to return to classrooms Monday after break, CNN reported, but educators are closely watching what happens next, as the governor expressed some concerns about the pending budget. Republican Gov. Matt Bevin has until April 13 to veto the bill. Brent McKim, president of the Jefferson County teachers union in Kentucky, said that if the governor “makes problematic vetoes in the budget,” teachers could react by escalating the conflict.